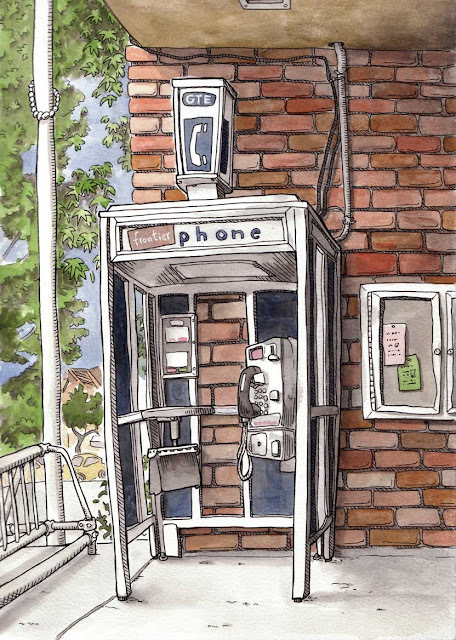 All of this quaint little seaside town to draw and I choose a phone booth. Well, they're cool and not going to be around much longer. 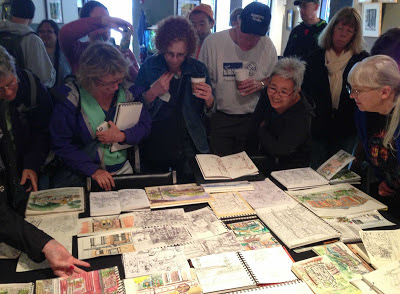 And a lot more interesting to draw than the handhelds that are making booths obsolete. Even the iPhone agrees- look at the icon on your smartphone- an old-fashioned hand-held device from a rotary phone! Kids using iPhones don't even know what that is. 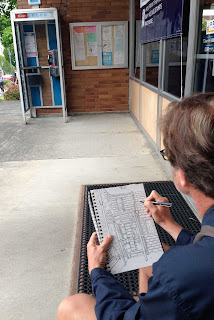 Ever try drawing a microwave oven? Boring! But remember your great-grandma's stove? Buildings, cars, furniture- streamlined and sleep-inducing as drawing subjects. I know, I sound like an old man bemoaning the good old days. So sue me. You sketched a piece of history. Nice! I actually haven't seen an outside like that in a while. Steve, you have such a talent for making the "ordinary" appear so "extraordinary"! I like it! Seems nostalgic. I love it Steve! It's iconic.